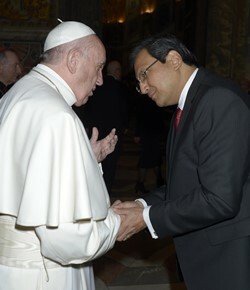 Sri Lanka's Ambassador to the Holy See Ravinatha Aryasinha participated in a series of events held in connection with the Occasion of the ‘Annual Hearing of the Holy Pope’ on 11th January 2016 held at the Vatican. 83 Resident Ambassadors and other concurrently accredited non- Resident Ambassadors participated in these events. During an interaction with His Holiness, Ambassador Aryasinha conveyed greetings from the President and Prime Minister of Sri Lanka to His Holiness and particularly appreciated the attention the Holy Father had given Sri Lanka over the past year long period since his visit to Colombo on 13 – 15 January 2015. He also assured him of Sri Lanka’s support to his global efforts, particularly in relation to social upliftment, the environment and inter-religious dialogue. President Maithripala Sirisena called on His Holiness Pope Francis at the Vatican today (14). Pope Francis expressed his happiness over the warm welcome and hospitality extended to him when he visited Sri Lanka last January and said that Sri Lanka is a beautiful island nation with friendly people. His Holiness commended the initiatives taken by the President towards peacebuilding and reconciliation in the country. Sri Lanka's Ambassador to the Holy See and Permanent Representative to the UN in Geneva Ravinatha Aryasinha called on the Secretary for Relations with States of the Holy See (equivalent to Foreign Minister) His Excellency Archbishop Paul Gallagher at the Vatican on 18 November 2015. Ambassador Aryasinha updated Archbishop Gallagher on the political, social and economic developments that had taken place since the visit of His Holiness Pope Francis, particularly aspects pertaining to addressing democracy and human rights related concerns, as well as ensuring a permanent peace and reconciliation. 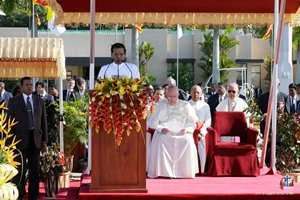 “I am convinced that the followers of the various religious traditions have an essential role to play in the delicate process of reconciliation and rebuilding which is taking place in this country”, said His Holiness Pope Francis speaking at the Bandaranaike International Airport upon his arrival, today (13). “For that process to succeed all members of society must work together; all must have a voice”, he further said. The visit of Your Holiness gives me an opportunity to receive your blessings as I commence my term of office, said President Maithripala Sirisena welcoming the Holy Father at Bandaranaike International Airport this morning (Jan. 13). The President, wishing the Pope a most fruitful and memorable journey in Sri Lanka sought the blessings of the Holy Father on the people of Sri Lanka and requested his prayers for the peace progress and prosperity of the people. 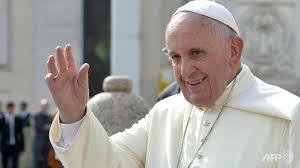 His Holiness Pope Francis arrived at the Bandaranaike International Airport this morning (Jan. 13). 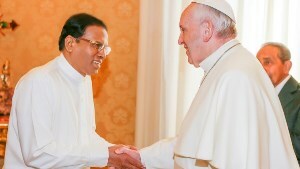 The Holy Father was welcomed by President Maithripala Sirisena. 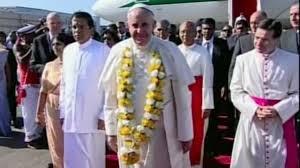 The special aircraft carrying Pope Francis and the Papal delegation touched down at the Bandaranaike International Airport. The main event in the Papal itinerary will be to declare Sri Lanka’s First Saint, Blessed Joseph Vaz, the Apostle of Sri Lanka, a Saint of the Universal Church at the Pontifical High Mass concelebrated with the Sri Lankan Cardinal and Bishops along with other clergy invited to participate at the special ceremony taking place for the first time in the annals of Sri Lanka. A stamp and a first day cover will be issued in honour of the Papal visit. A special gold coin is also to be issued. 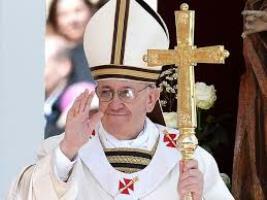 On the invitation of President Mahinda Rajapaksa, His Holiness Pope Francis will pay a State Visit to Sri Lanka from 13th to 15th January 2015. The Government and people of Sri Lanka are looking forward to warmly welcoming His Holiness and his delegation. All arrangements for the visit are in place and the required constructions are progressing on schedule including the altar at Galle Face Green where the Special Mass and the canonization of Blessed Joseph Vaz, which will take place on Wednesday 14thJanuary. 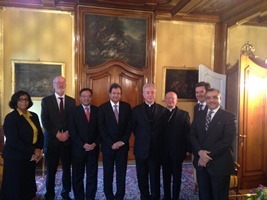 Ambassador Ravinatha Aryasinha met Archbishop Dominique Mamberti, the Secretary for Relations with States of the Holy See at a luncheon meeting on 6th December 2014 in Bern. The luncheon meeting was organized by Monsignor Diego Causero, Ambassador of Holy See in Bern for diplomats accredited to the Holysee, on the occasion of Archbishop Mamberti’s visit to Switzerland. At the meeting Ambassador Aryasinha updated Archbishop Mamberti on the arrangements for the visit of His Holiness Pope Francis to Sri Lanka in January 2015. 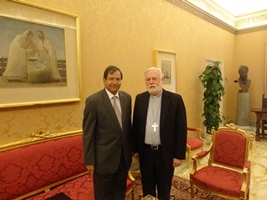 They were confident that the visit will further strengthen ties between Sri Lanka and the Holy See. President Mahinda Rajapaksa who was received at an audience by His Holiness Pope Francis I this morning extended an invitation for His Holiness to visit Sri Lanka in January next year. President Rajapaksa and First Lady Shiranthi Wickremasinghe Rajapaksa who arrived at the Vatican this morning were received with honor by Head of Vatican Protocol Office, Msgr. Jose Avelino Bettencourt. The traditional Swiss Guards of the Vatican formed a Guard of Honor to the President. Later the President, First Lady and members of the Sri Lanka delegation were escorted to Apostolic Palace where President Rajapaksa had his audience with His Holiness at the special audience hall of the Palace. The Holy See Press Office issued a communiqué Tuesday confirming the dates of the Apostolic Trip of the Holy Father in Sri Lanka and the Philippines. Accepting the invitation from the civil authorities and the Episcopate, His Holiness Francis will make an Apostolic Trip to Sri Lanka from 12 to 15 January and in the Philippines from 15 to 19 January 2015. The program for the trip will be published shortly. His Holiness Pope Francis met Sri Lankans at St. Peter’s Basilica in Rome in a special audience he offered to the migrant Sri Lankans living in Italy on 8 February 2014. 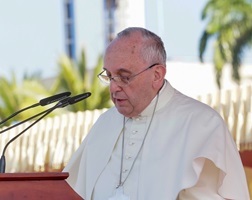 Addressing the congregation of some 15,000 Sri Lankans at the invitation of His Eminence Malcolm Cardinal Ranjith, and referring to the invitation to visit Sri Lanka, Pope Francis said "I accept it and believe the Lord will give us this grace". 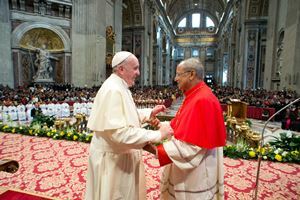 His Holiness Pope Francis received Secretary of Defence Gotabaya Rajapaksa at an audience in the Vatican on Wednesday. 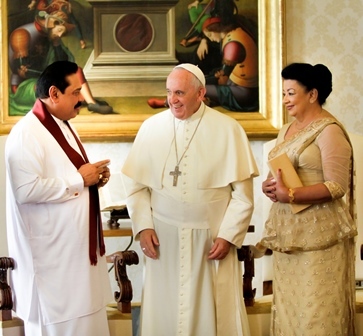 Mr. Rajapaksa who visited the Vatican as the Special Envoy of His Excellency the President, conveyed to Pope Francis an invitation from President Mahinda Rajapaksa to visit Sri Lanka in the near future. During his visit, the Secretary also paid courtesy calls on dignitaries of the Vatican City State. Mr Rajapaksa appreciated efforts by the Holy See to promote world peace, disarmament, interfaith dialogue and dialogue among civilisations. He said that as a nation that has been blessed with a multi-ethnic, multi-religious and multi-cultural social fabric, and more importantly as a country that was coming out of a long period of conflict, Sri Lanka valued the strength that comes from the unity of the diverse communities in Sri Lanka. After almost thirty years of suffering, Sri Lanka had embarked upon a new era of development and reconciliation for all its people and looked upon the international community for encouragement and support. 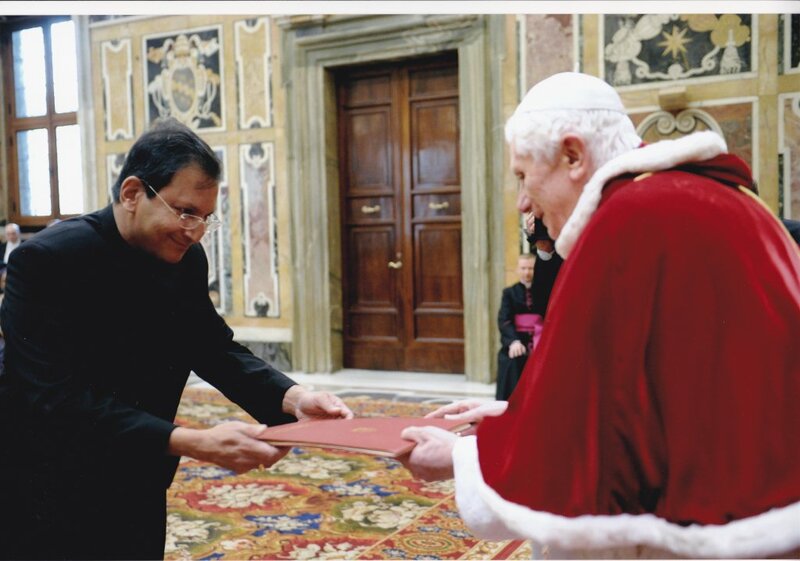 Ambassador Aryasinha presents credentials to Pope Benedict XVI. 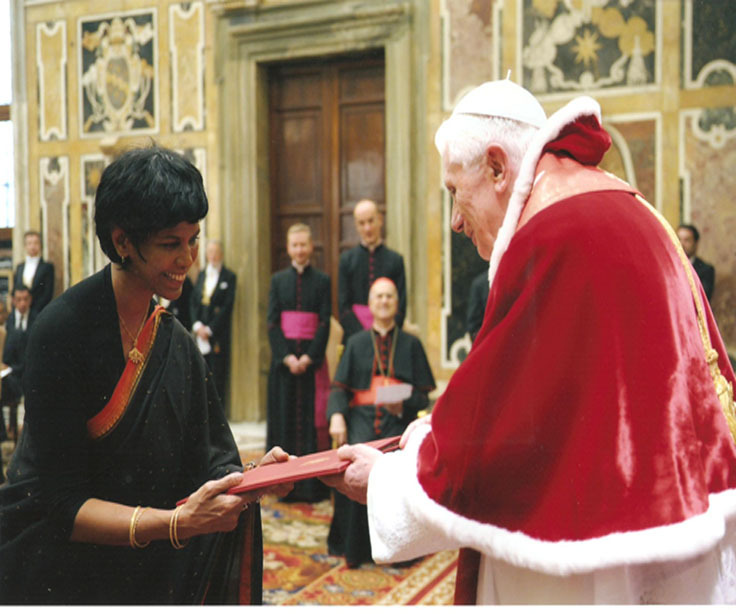 Sri Lanka's Permanent Representative to the United Nations in Geneva Ravinatha Aryasinha, who is concurrently accredited to the Holy See, presented his credentials to His Holiness Pope Benedict XVI on the 13thof December 2012 at a ceremony held at the Apostolic Palace at the Vatican. Sri Lanka’s Permanent Representative to the United Nations in Geneva, Ambassador Tamara Kunanayakam, who is concurrently accredited to the Holy See, presented her credentials to His Holiness Pope Benedict XVI at a ceremony in the Vatican on 15th December 2011, in the presence of His Eminence Cardinal Tarcisio Bertone, Secretary of State of the Holy See, and other high officials of the Vatican. Non-resident Ambassadors from the following 10 countries also presented their credentials at the ceremony: Pakistan, Thailand, Trinidad and Tobago, Guinea Bissau, Switzerland, Burundi, Mozambique, Kyrgyzstan, Andorra, and Burkina Faso.